Amazon Price: $169.00 (as of October 18, 2017 7:28 am - Details). Product prices and availability are accurate as of the date/time indicated and are subject to change. Any price and availability information displayed on the Amazon site at the time of purchase will apply to the purchase of this product. 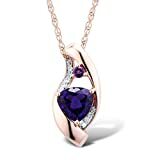 Stunning Pendant in 10k Rose Gold features a 6MM Trillion (triangular) shaped Amethyst (treated) in an artistic modern setting. There are 10 round diamond accents and 1 round 2MM Amethyst (treated) accent. The combination of the purple amethysts and rose gold is stunning. The diamonds are HI Color, I2-I3 Clarity, .04 cttw. Diamonds are set against White Rhodium Plating. Pendant comes with an 18" Rope Style 10k Rose Gold Chain. The natural amethysts have been heat-treated to permanently improve color. We recommend cleaning with warm soapy water and a soft cloth. This pendant is now also available in Rhodium Plated 10k White Gold.